Historically, the 170V was first displayed by Mercedes Benz at the 1936 Berlin Motor Show and enjoyed a production from 1935 to 1941. 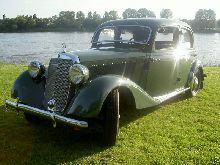 It exceeded that of any other pre-war car and provided the basis for the resumption of Mercedes car production following World War II. 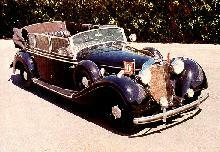 The Pre-War 170V was produced in several models, a Cabrio-Limo, Cabriolet A and B models, and a very rare Roadster. The 170V continued in 1947, with the 170D and S models being produced. The 170 S was introduced at the Hanover show in 1949. It was based on pre-war designs. The bodywork was similar to that of the 230 (W153). Its all-round independent suspension gave the car an edge on the competition. That same year, Cabriolet versions of the 170S were also introduced and ended in 1951. 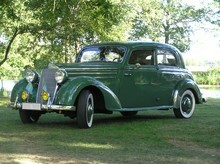 In 1949, the 170V model was introduced, with subsequent variants of the Va and Vb models. In 1953, S-D and S-V versions were introduced, and although their production was limited, they were actually stripped-down models of the S. The 170 sedan series ended in 1955. The 230 is the direct ancestor; by taking the 230 chassis and body, and adding a modified 170 engine, it became the 170S, and later modification created the 220.